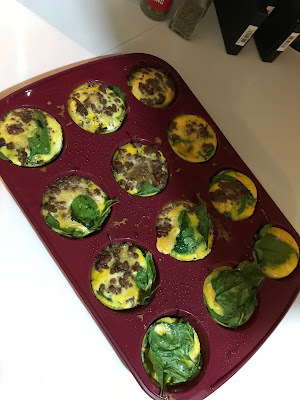 "Day 1: My usual banana and coffee was replaced with a coffee and 2 pre-prepared egg cups (eggs + spinach + lean ground beef baked in cupcake form, reheated and seasoned to perfection). Quite tasty and a good change to my usual. And... I wasn't hungry an hour later. But when I was at work, I found my mouth watering constantly. I drank more water the first 2 hours of work than I sometimes do all day. My body was definitely not used to this new routine. 10:30 Snack: Carrots and hummus. A staple in my mind and something I eat almost daily. It subsided my watery mouth short term, but as work began to pick up it was a good distraction from my body sending out an SOS for sugar. 1pm lunch: Spinach salad with pine nuts, walnuts, grilled & seasoned chicken, feta cheese, and homemade balsamic vinaigrette (balsamic vinegar, olive oil, salt & pepper, no brainer). What I REALLY wanted was my granny smith apple and almond butter but was saving that for afternoon snack. On this detox you're allowed either 1 green banana (yuck, disgusting) or a green apple a day. And that's all the fruit you can eat. I don't even like green apples, but I LOVE apples to an unhealthy level so I decided to go for it and used the almond butter to soften the sour. It worked. Still not as satisfying as my honeycrisp and peanut butter, but it'll do for the time being. After my 3pm snack of granny smith apple with almond butter I walked into a co-workers office and stood there and simply said, "Banana." She laughed in hysterics. DAMN JUST GIVE ME A BANANA ALREADY. 5:30pm swim workout: warmup was definitely sluggish and I felt winded much quicker than normal. Uh oh, this could be a rough 3 weeks. However, this could also be a result of a hard run over the weekend. As I got into the workout I fell into my groove much quicker and started to feel like my old swim self. Crisis averted. 7pm dinner: scrambled eggs with onion, mushrooms, peppers, spinach and cheese. A side of mashed sweet potatoes (athletes allowed 1/2 cup of sweet potatoes or 1/2 cup of quinoa daily on this sugar detox) with butter. Unsweetened almond milk to wash it down and I'm officially through day 1 of no sugar and I'm not twitching, nor do I have a headache. But my mouth is definitely salivating much more than normal..."
The above was written on January 8th, 2018. 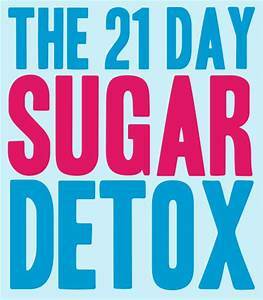 At the time, I had just started a 21 day sugar detox. Sounds simple enough, but we're talkin' ALL sugars. Carbs and fruits included. Literally if there was ANY sugar in the food, I wasn't allowed to eat it, natural or not. 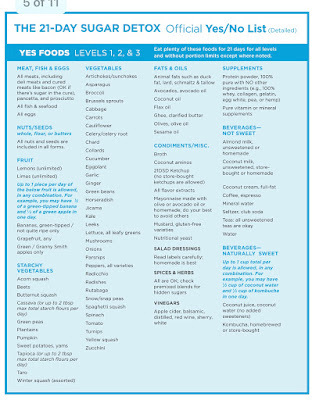 My list of go to foods included, all forms of meat, eggs, most veggies (starchy potatoes a no-no), most nuts, unsweetened almond milk and coconut milk, with a side of water. Mmmmmm. I was planning on keeping a daily log so I could write a blog about how the entire process went. But, we all know plans change. BUT MEGAN, WHY? YOU DON'T NEED A DIET! No, the intention was never to "lose weight" by any means or to go on a "diet". After I got home from Chattanooga twice in the month of September, I slowly but surely fell into a spiral of all the foods I shouldn't be eating. And then the holidays came. I said no to nothing. I gained maybe a few pounds, but that wasn't the point of this at all. The point was, I wanted to feel better. I was constantly tired and sluggish. I was always craving something sweet and caving at the drop of a hat. I was finding less and less joy out of the veggies I usually thrived on. 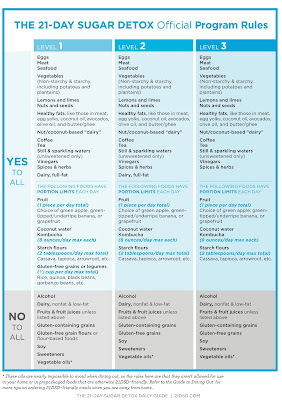 I needed to reboot my system and what better way to do it than to eliminate every last bit of sugar in my diet? My menu for the next 21 days! If there was ever any question, this chart answered it. You all remember Kait, right? 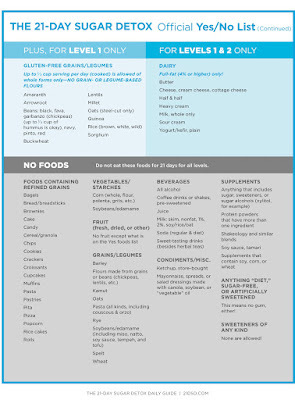 She introduced me to this diet a few years ago and I attempted it circa 2015. But when a few family members fell ill, it was near impossible to live on hospital food without sugar in it. (Ironic, yes?) I had to call it quits halfway through the 21 day program just so I could I simply eat at the hospital while visiting family. Assuming I didn't have any "life" curveballs this time around, there was no reason I shouldn't be able to complete the detox. The nice part about this detox is that there is an athlete version that allows anyone who is active, a specific amount of natural sugars a day. I focused on the 1 green apple a day, 1/2 cup of sweet potato or 1/2 cup of quinoa a day. That was what I allowed myself in the form of "athlete foods". I decided to give myself the best chance and started on January 8th. S-NO-W Fun Run is always the first weekend in January and the thought of missing out and watching my friends eat and drink the night away sounded like a nightmare. Starting after my favorite winter running party was what I was going to do. Crazy amounts of mouth watering on Day 1. Holy cow. The most awkward thing as I felt like I was constantly spitting all day when I spoke. By Day 2 the mouth watering subsided but was still most definitely more active than normal. I wanted a banana like you wouldn't believe. I live on bananas. Between the coffee pot and my favorite food ever, it's a close tie for which I touch first thing in the morning when I wake up. During the day, I felt completely normal. No headaches. No mood swings (that I noticed of myself, but no one told me I was moody either). No shakes. Just me. While I worked out, it always took me longer than normal to get my momentum going. Warmups felt like workouts. The workout felt like I was racing almost every time. And, my ears ALWAYS felt plugged up when I was working out (swim, bike or run). Why? I have NO idea. But I definitely noticed a huge difference in my ears while working out. DRASTIC weight loss. Enough that it scared me a little. And made me rethink this entire process. The first couple of days I didn't think to much about the workout sluggishness. I knew there would be an adjustment period and I was willing to see what the other side was like. Except, when I woke up on day 5 and stepped on the scale. I had lost 6 lbs in 5 days. Uh oh, this isn't good. I immediately followed that up with my usual Friday workout, a swim and a shakeout run. It took everything I had in me to finish 3 measly miles. It was time to re-evaluate, for sure. I didn't want to completely throw in the towel just yet, but I knew that my Saturday long run was definitely going to suffer and possibly injure me if I didn't make some adjustments. My cousin (who happens to be a rockstar dietician) created this phenomenal energy balls that I was planning on using on my run (since gels and the usual running nutrition was a no-no) but I was starting to think that even that wouldn't save me. I already had my lunch/snacks packed for that Friday of work so I needed to formulate a plan by dinner time. 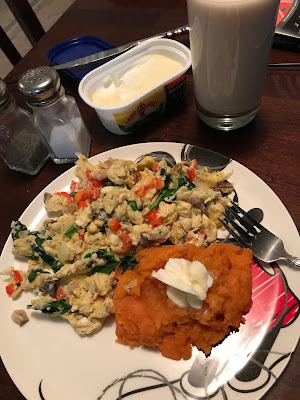 After discussing with a few co-workers, I decided to add in some carbs to my dinner that night to help fuel my run in the morning. Dinner included steak, green beans, sweet potato, and 2 dinner rolls with butter (and regular ole 2% milk). Definitely nothing drastic. But after dinner I can't tell you how different I felt. The only additions I ate were the 2 dinner rolls and a glass of milk. THAT'S ALL IT TOOK FOR ME TO FEEL A BIT MORE ENERGIZED. The next morning I ate my usual egg cups that I had prepared and a few of the energy balls pre-run. I also weighed myself again and was officially down 6.5lbs in less than 6 days. Once I was done with this run, I was positive my next meal was going to include more Sugar than I had consumed in the past week. 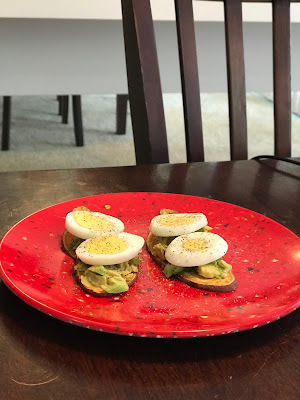 My "if I have time breakfast"
Sweet potato toast, avocado, and a hard boiled egg. DELISH! So, was it worth it? Totally. I know people think I'm nuts when I have these crazy ideas. But now I can definitely say I think twice before I put food in my mouth. I opt for different choices, less bread, more veggie. I wanted my taste buds to come back to normal, and they did. I'll call it a success. You might also remember, Jacqui did this same detox during the month of December before going on a family cruise over Christmas. You'll never believe the difference in our stories. Read about it here if you're interested! That just goes to show ya, every body is created differently and everyone has separate needs. Was it hard to avoid sugar? No. It was actually easier than I thought. After I got past the first day, I didn't think about it much. Sure I was envious of my coworker as he walked in a Chipotle burrito the size of my head for lunch, but I never dwelled on it and it wasn't hard to sit and eat my meal next to him at all. In fact, I got engaged on Day 3 of the sugar detox. And still, I wasn't even tempted to bust out the champagne at all. I was pretty determined to make it through this. As you can see, I ate pretty damn well during this 6 day stint. And had some great ideas and recipes to follow in the days to come. But, my health comes first. And most importantly, I've got some big goals this year. And I'm not about to compromise them for anything. Until next time, friends. Cheers.